PennsylvAsia: APA Y-Advocate training for high school students, November 11 at Pitt. 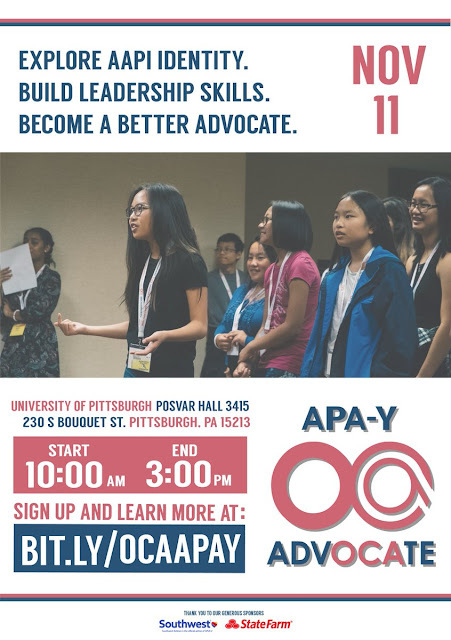 APA Y-Advocate training for high school students, November 11 at Pitt. The Organization of Chinese Americans will hold a half-day session for Asian Pacific American high school students on topics of leadership, community engagement, career planning, and financial responsibility at the University of Pittsburgh on November 11. APA Y-Advocate is a half-day interactive training for Asian Pacific American high school youth funded by State Farm that teaches leadership driven community engagement, career planning, and responsible personal financial management before going to college. The session runs from 10:00 am to 3:00 pm in 3415 Posvar Hall (map). Registration is required and can be done online.